Happy Friday! Here's some favorites of the week! I just started two Fitness Blender programs at the same time, FB Flex (upper body) and FB Booty (lower body). Each program has 3 workouts a week, so I just staggered them so I have 6 days of alternating workouts! Hopefully that makes sense. The favorite one that I can recall for this week is the Upper Body - Guaranteed Muscle Burnout workout led by Daniel. I am trying my best to start really pushing myself to lift heavier on upper body workouts. It's really, really tough for me since my arms are nowhere near what my legs are. I've almost outgrown my weights for lower body exercises, but still struggle and can only do 10 to 16 pounds total for many upper body lifting exercises. I definitely want that to change, and the only want to make it change is to push much harder, so I really went for it this workout and lifted as hard as I could stand while keeping good form. I shook the entire workout and pretty much melted into the floor by the time I was done, but felt so proud after! I was so sore for 2 days, but I definitely saw how much I'm capable of pushing! Not shockingly, my two favorite recipes this week were courtesy of Cooking Light! This was really, really tasty. I've always scoffed at the whole Elvis peanut butter, bacon and banana sandwich folklore, but I've gotta say that Elvis was on the money here. 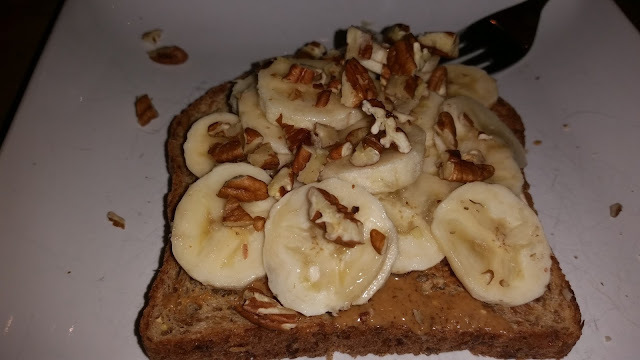 Bacon in small quantities is not only delicious obviously, but it's not really high in calories, and there's just enough here to provide a nice smoky saltiness to the banana's sweetness, the pecans add a nice crunch and the nut butter adds creaminess and makes it feel extra indulgent. I'd been in a breakfast rut lately, and this definitely made me excited about eating in the mornings again! The recipe is here, but I slightly tweaked it. 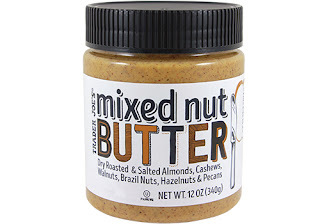 I used a half a banana on my toast and also used Trader Joe's mixed nut butter (reviewed below) instead of straight up almond butter. I was surprised at how filling this was! This was another dish that really hit the mark when it comes to having complimentary flavors, texture and color. It's also a very simple dish, especially if you make the beans and rice in advance. It also made me question why I don't cook flank steak more since it's both inexpensive and delicious! The crunchiness of the pumpkin seeds (can't you tell I love crunchy things in dishes?) really added to this and kicked it up a level. I think this dish would have been just as good without the dressing, but the dressing was really nice. The recipe is here. (Just to note, I did tweak the dressing based on what I had on hand. 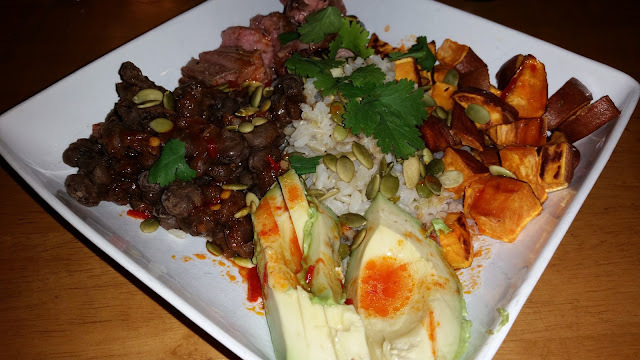 I used harissa paste instead of chipotle chilies and used Grade A maple syrup instead of honey.) Also if you want to kick your beans up a notch, add a half to full teaspoon of lime zest. It especially elevated a dish like this! Please pardon me while I look like a total schill for Trader Joe's this week, but I picked up two impulse purchases there that ended up being amazing! I saw this on the shelf when we were shopping Saturday and grabbed it on an impulse and I'm so glad I did! I eat peanut butter all of the time (although I have to be careful with brands because it can cause horrible heartburn for me), but really am not a fan of almond butter. It just has a muddy taste to me and doesn't really do much for me. 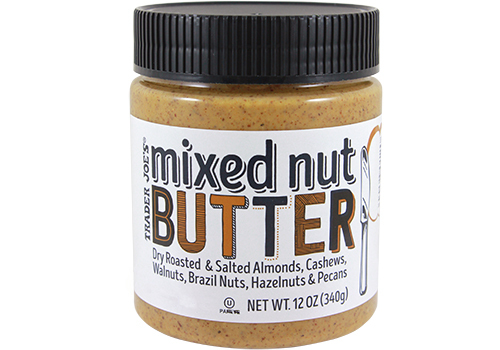 The mixed nut aspect of this really appealed to me however since I love cashews, hazelnuts and pecans, and I definitely wasn't disappointed. You can definitely taste all the the individual nuts going on in there, so it gives it a more complex flavor. I also like that it stays sort of liquidy, for lack of a better term. It just feels lighter than peanut butter and makes it really easy to drizzle over things, and I especially enjoyed drizzling it over a banana for a nice hefty snack in the afternoons. 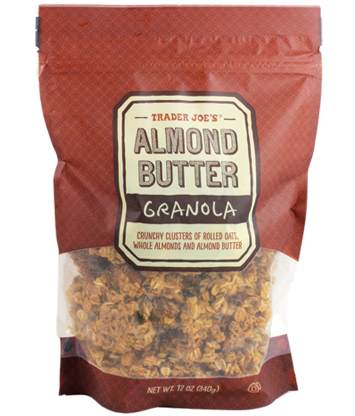 I was looking for some granola just to mix up breakfast this week and also impulsively grabbed this at TJ's. Oh my God. Usually I'm whatevs about granola, especially since most of it is sickly sweet and the serving sizes are too tiny to be worth it. This one is a very generous half cup serving and is delicious! The whole almonds in it provide a great crunch and toastiness, and to me it's not as sweet as other granolas I've tried. I've really been enjoying it as a topping for smoothie bowls this week (it's not fancy, I just pour smoothies into a bowl instead of a cup) and it's really been so delicious and filling. It does have 9 grams of sugar a serving but you know, YOLO. That's funny.My husband has that issue with peanut butter and it makes him so sad when he sees me eating it because it wreaks havoc on his digestive system. And he hates almond butter. What brands of peanut butter have you found that don't cause the heartburn? I will try that mixed butter. Maybe whole foods has it.